Congratulations to Timmy McCarthy. His company, RCO Limited, is set to open a new Raising Cane's restaurant this spring at 800 N. Bridge St. in Chillicothe. It will feature a new design, the first of its kind in Ohio, which enhances the already fun, cool and energetic environment for which the chain is known. Timmy is founder and culture captain of RCO Limited, the largest franchise organization within the Raising Cane’s system with approximately 30 restaurants in central Ohio, Cincinnati and Dayton. The Chillicothe location will be the chain's 16th in central Ohio. The Raising Cane's menu is very specific, offering chicken fingers, fries, garlic toast, cole slaw, drinks and the Cane's signature dipping sauce. The restaurant chain was originally set to be named Sockeye's Chicken Fingers to commemorate the fishing trips owner Todd Graves used to raise money to start his original restaurant. In the end, however, Raising Cane's found its final moniker in Graves' dog, a yellow Labrador that used to hang around the building site of renovations to his first restaurant. With that canine connection in the franchise's past, the Chillicothe location will include a plumbed dog water bowl that will be available on the patio. 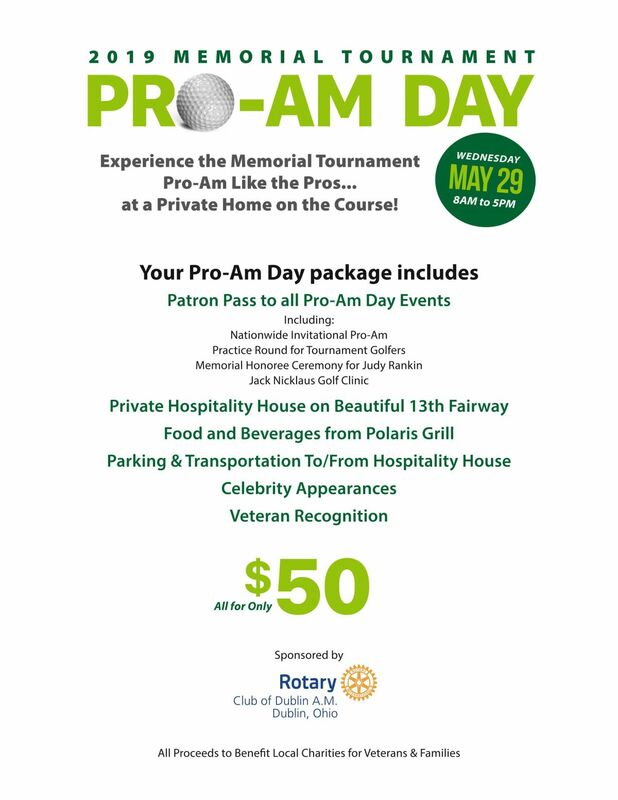 The Moulton Memorial Golf outing is scheduled for Friday May 24th, 2019. Tee times start at noon. Pay green fees to golf course all prizes provided by club social fund. The good folks at FC Bank have agreed to be the presenting sponsor for the Rotary Family Picnic on the 4th of July. Jenny Saunders, President of FC Bank, and her colleagues will attend our April 17th meeting for a check presentation. This will be a terrific opportunity for our club to thank FC Bank for their generosity. Approved: Membership application of Andrew Saneholz as of March 15, 2019. Discussed: Preparations for Fourth of July picnic. Approved: Expenditure of up to $1,000 for fund raising activity for twin club vocational-technical program in Dominican Republic. Approved: Expenditure of $1,000 for participation in District 6690 New Generation Service Exchange program. Discussed: Preparation of District Grant proposal for dictionary project. Discussed: B. J. Stone Paul Harris fellowship presentation. Discussed: District Conference recognition of recently deceased club members. Packaging of the trees we donate to 5th graders at four local schools will take place at our April 24th meeting. The more members helping will make the packaging go faster. It should take less than an hour. PLEASE BRING A FULL LOADED STAPLER WITH YOU. We will put one seeding in a bag and staple the directions for planting to the bag. A few of us will deliver the trees to the schools on the 25th and the teachers will distribute to the students on Arbor Day on the 26th. Big thanks to Mike Moultan who is also the co-chair for this project. You Can Get that at the Library!? 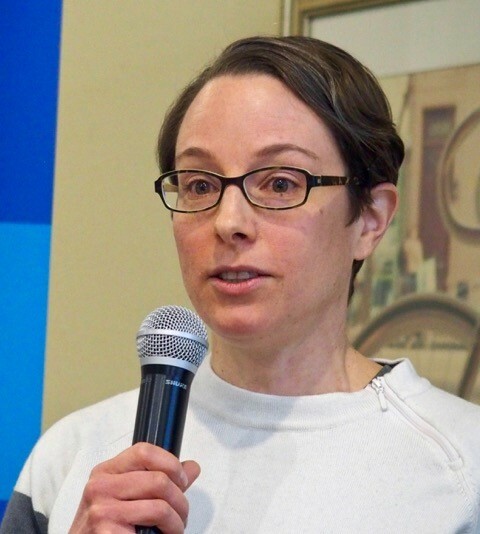 At a recent meeting Meredith Southard from the Worthington Libraries spoke to our club about some interesting services that one might not realize they can obtain from the library. You can visit the services page www.worthingtonlibraries.org/visit/services to learn more. They include “nontraditional” items such as “adventure kits,” or kits that allow you to learn a new hobby such as sewing machines, telescopes and ukuleles, as well as practical items such as auto code readers, mobile hotspots and others. Other offerings just for kids include Discovery Kits, Power Packs and much more. For movie buffs, there is GoChip Beams and Binge Boxes to expand your viewing options. Beyond items you can check out, the library also offers notary services, passport application processing and one-on-one appointments to help you with research questions and more. Visit the links on our site to learn more about each service and how to schedule an appointment. There are also several new database offerings available free to Worthington Libraries cardholders. The Columbus Dispatch archives lets you read articles from 1871 onward. The library's New York Times subscription allows you unlimited access to articles on the nytimes.com website for 72 hours at a time. Lynda.com offers thousands of courses taught by experts on a range of technical, business and entrepreneurial subjects. And Creativebug provides video courses on crafts and arts. The Worthington Libraries have been a wonderful partner for our club. Club members spend 90 minutes per week at the Homework Help Desk at the Northwest Library to help elementary age students with math, reading or other homework. If you’ve visited Christie Bruffy’s coffee shop in Old Worthington, Highline Coffee Co., you know there isn’t much room to relax with your cup of coffee. That’s soon to change. At a mere 267 square feet, the primarily grab-and-go coffee spot is about to expand into the neighboring storefront, formerly Pure Cottage, more than doubling the shop’s space. The additional space will allow for 18 seats and will create a true community gathering spot. Christie expects the renovations will be done by early May, just in time for the start of Worthington’s popular Farmers Market. 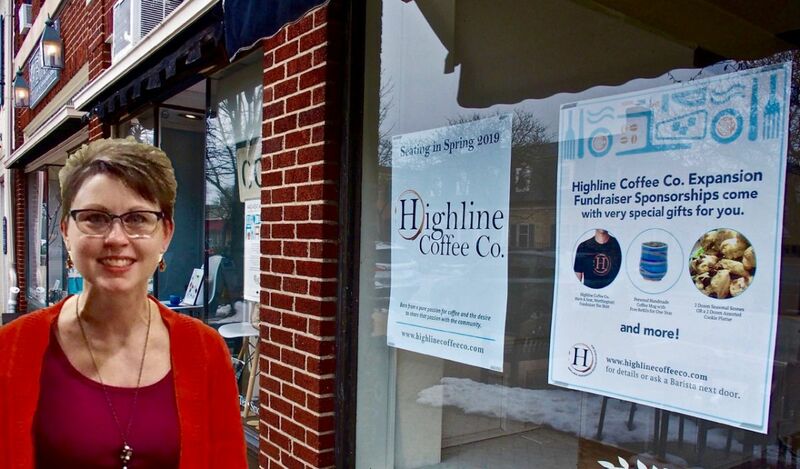 Customers and friends asked Christie how they could help transform her local coffee stop into a neighborhood coffeehouse; thus, a sponsorship fundraiser was born! The fundraiser runs through Friday, March 1, with sponsorship gifts available after the grand opening in May. Want to help Christie? Go to: http://store.highlinecoffeeco.com. The vote is in, and the result is that Zach Manifold is headed for a new job. Zach, who has been manager of absentee voting at the Franklin County Board of Elections for the past four years, is moving to the county’s auditor’s office. Starting in mid-March, Zach will become deputy chief of staff for Michael Stinziano, who was elected to county auditor in November. Congratulations to Zach. Approximately 20 club members participated in the recent personal care item drive to benefit the neighbors of the Worthington Resource Pantry. According to club member Nick Linkenhoker, who is executive director of the pantry, it was a successful effort with a total of 208 pounds of donations. Club members donated a variety of items, including shampoo, soap, toothpaste, toothbrushes and “a whole lot of diapers,” during the two-week drive in February. The diapers were gone almost immediately, Nick said. The community service committee spearheaded the drive, which was coordinated by Rachael Dorothy and Carol Sommer. Contributions of personal care items were requested because there is generally a great need for these items at this time of year. Members, who recorded their donations, are: Mark Beaver, Christie Bruffy, John Butterfield, Larry Caldwell, Rachael Dorothy, Chuck Gibson, Bob Hanson, Connie Hendren, Dave Jordan, Jerry Katz, Sam Milliron, Bonnie Mitchell, Steve Payerle, Ann Pechacek, Harry Pukay-Martin and Carol Sommer. 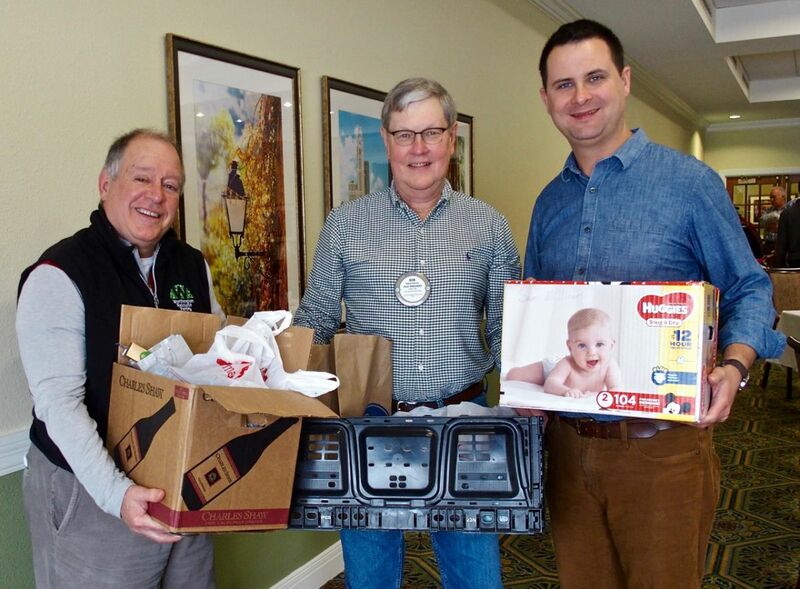 Packing up the donations of personal care items for delivery to the Worthington Resource Pantry are club members, from left, Harry-Pukay Martin, who is chairman of the pantry board, Bob Hanson, and Nick Linkenhoker. Nicole Lopez, has taken a new position. She is director of development and communications for Montaña de Luz, which provides family-based, coordinated care for children and families affected by HIV/AIDS in Honduras. The children range in age from preschool to young adulthood. They come from a wide range of family situations and have special dietary, medical, educational and psychological needs. Many of the children have experienced extreme poverty, neglect and oftentimes abuse. For more information about the organization and its work, go to: https://www.montanadeluz.org. The visitation and funeral arrangements have been announced for David Elder, who passed away on Saturday. Two visitations will be held on Sunday, March 3 -- from 11 a.m. to 1 p.m. and from 4 p.m. to 6 p.m. at Rutherford-Corbin Funeral Home, 515 High Street, in Worthington. The funeral service will take place on Monday, March 4, at 10 a.m. at Maple Grove United Methodist Church, 7 West Henderson Rd., Columbus 43214. A visitation will be held an hour before the service. The City of Worthington has posted a tribute to David: https://worthington.org/CivicAlerts.aspx?AID=710. If you would like to send a card or note to Ann, the address is: 263 Heischman Ave., Worthington, OH 43085. Approved: Membership for Mark Beaver, Beth Liston and Teresa Russell. Approved: Membership for Hillary Colvin as of February 27, 2019. Approved: Resignation of Jack Turner as of January 15, 2019. Discussed: Membership limitations by occupational categories. Approved: Officers and Directors for 2019-2020 board. Discussed: Preparations for the Fourth of July Picnic. Discussed: Recent visit by club members to Dominican Republic to participate in twin club medical and educational projects. Discussed: Arbor Day, Dictionary, Mirolo and Worthington Food Pantry community service activities. Approved: Allocation of up to $1,200 of board discretionary funds to support participation of Youth Exchange students at upcoming district conference. Approved: Allocation of $150 to support Hospitality Suite at district conference. Approved: Allocation of $300 to support P.E.T.S. conference children’s blanket project. Approved: Reimbursement of registration fees for attendance at district meetings - 100% for club members at district assemblies; 100% for club officers at district conferences; and 50% for other club members at district conferences. Let’s hope the club doesn’t “go to the dogs,” as a result of New Member Keith Sharick’s five-minute profile. Keith’s entertaining presentation on February 20 included a video of dogs Harley and Charley romping around his living room. Keith is originally from the northeast part of Ohio and was the second of four children. (He jokingly admitted to being the worst of the four.) He was introduced to Rotary early in life, as his father was actively involved in his community’s Rotary Club. He assisted his father with many club projects, including pancake breakfasts and helping in schools. A graduate of The Ohio State University, Keith is a sales agent, realtor and seniors real estate specialist for HER Realtors in the Dublin office and is a NAR (National Association of Realtors) Certified Pricing Strategy Advisor. He is a member of the Senior Services Roundtable of Columbus and Franklin County and the Delaware County Task Force on Aging. He also serves on the Ambassador Club of the Dublin Chamber of Commerce. He and fellow member Dawn Lehman live In the Hilliard area, and Keith has a son, Kevin, who was married in 2018. Kevin had an excellent realtor who found the newlyweds a great home. Keith’s hobbies include camping, OSU sports and home projects. “Each of us is given gifts, and we need to use them to help other people,” Keith said. That’s why he is excited to be a Rotarian and join fellow members in serving those in need in our community. The club’s board of directors elected officers for the coming year at the annual meeting of the board on February 21. Returning to leadership roles on the board, effective July 1, are: John Butterfield, president; Bill Shantz, president-elect; Jerry Katz, treasurer; Dave Hansen, secretary; and Alan Grossman, past president. Jim Miller was elected vice president. John Butterfield has served as vice president and president-elect over the past two years. Bill Shantz is serving as vice president during the current year. Jerry Katz has served as treasurer since 2010. Dave Hansen was appointed to the position of secretary in 2017 to replace Judy Bryant and elected to the post in 2018. Alan Grossman has served as president, president-elect and vice president over the past three years. New in an officer role is Jim Miller, who has been a member of the club since May 2015 and a Rotarian for 17 years. He led the club’s strategic planning process in 2016 and has served on the board for three years. Jim is a member of the international service, ways and means and program committees and chairs the strategic planning committee. He has also participated in the distribution of dictionaries, worked at the Fourth of July Rotary Family Picnic and arts festival event and been involved in several other projects. As a prior CEO of a non-profit, Jim has learned how to help others recognize service opportunities, inspire and assist them in becoming involved in local and international community projects that can have high impact along with encouraging others to be involved in leadership. He believes in group decision-making and collective group leadership and development. He also has strong skills in financial management, committee development and organizational structure. Jim would like to see the club continue to build on the work that has begun over the past several years. Among these efforts are: increasing membership with focus on younger members, encouraging immediate involvement of new members and increasing visibility in both the Worthington and Dublin communities. Developing fundraising opportunities, strengthening the Rotary Family Picnic and continuing international projects are other priorities. Foremost is his desire to continue our club’s reputation as being known as a fun-loving club with great friendships. As vice president, he would like to assist the Community Service Committee in enhancing its level of involvement with club members and organization. 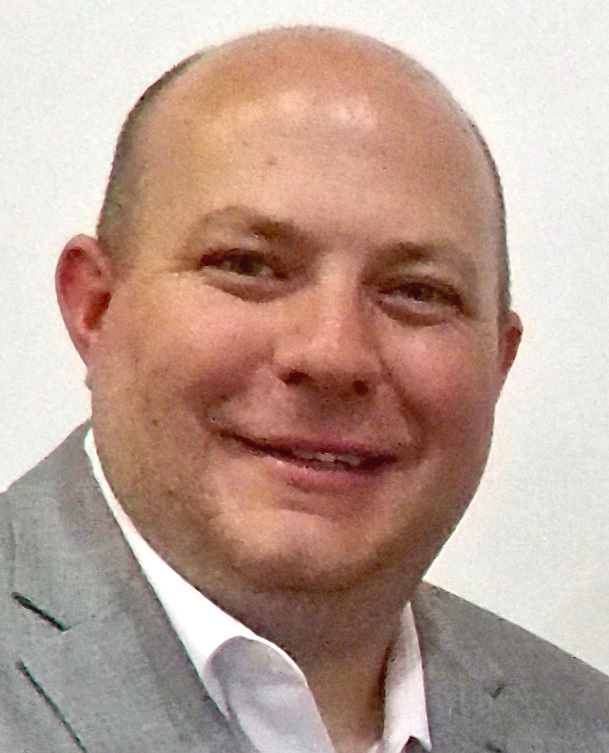 Taking part in the election of officers, as stipulated in the club’s bylaws, were Nick Linkenhoker and Steve Payerle, who were elected to the board in December at the club’s annual meeting. Dave Kittredge, who will also begin a two-year term on the board in July, was unable to attend. He is in the Dominican Republic visiting with leaders of our sister club in Santiago. 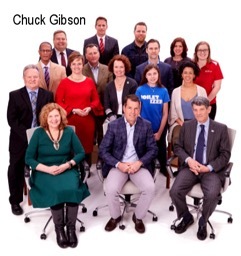 Member Chuck Gibson, director and chief executive officer of Worthington Libraries, was in the news recently. Worthington Libraries was named one of Columbus' National Number Ones, a list generated each year by the Columbus Foundation, based on achievements by industry peers. The selection was due to the libraries’ status as a Five-Star Library. Not only is Worthington Libraries now one of only 10 libraries in the nation-- out of more than 7,000-- to have received the highest rating in every Index of Public Library Service, it was also ranked #1 nationally in its budget category – expenditures between $5 million and $9.9 million. Chuck has served as head of Worthington Libraries since August 2010. He joined our club two months later. Trevor Petrel, director of advanced technology development, Battelle: R&D100 award for ThreatSEQ webservice. Jennifer Seifert, executive director, Charitable Pharmacy of Central Ohio: Community Pharmacy Innovation in Quality Award, Pharmacy Quality Alliance. 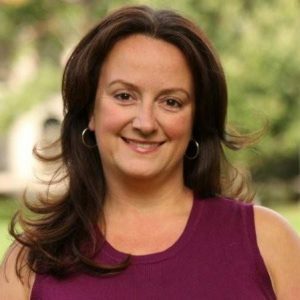 Christy Farnbauch, executive director, National Association of Women Business Owners Columbus, #1 Chapter in the U.S., National Association of Women Business Owners. Guy V. Worley, president and CEO, Columbus Downtown Development Corp.: First-ever National Veterans Memorial and Museum, U.S. government. Steve Allen, CEO, Nationwide Children’s Hospital: ABMS Multi-Specialty Portfolio Program Outstanding Achievement in Quality Improvement Award, American Board of Medical Specialties. Ohio State Center for Automotive Research: 1st Place, EcoCAR 3 Advanced Vehicle Technology Competition, U.S. Department of Energy. Claire Rhodes, Liberty Elementary School student: Most Visionary Award, National Invention Convention and Entrepreneurship Expo at The Henry Ford Museum of American Innovation. Ken Schnacke, president and general manager, Columbus Clippers: Executive of the Year, International Baseball League. A story about new member Jen Goebbel and the event she initiated at Thomas Worthington High School to celebrate female athletes, was featured in the February 14 issue of ThisWeek Worthington. Jen, who is the school’s athletics/activities director, invited female athletes from the high school and feeder middle schools to the special event on National Girls and Women in Sports Day on February 6. The program, which included five guest speakers, recognized the value sports has in the lives of students. In the story, Jen indicates that many correlations can be found between women who have played sports and workforce success, so she is confident female athletes’ success will transfer into other parts of their lives. She hopes that success continues for them professionally. Perhaps some of Jen’s student athletes will become involved in Rotary while they are in high school (Youth Exchange, RYLA) or college (Rotaract) or when they begin their careers. With their drive to be successful athletes and their commitment to good sportsmanship, many of these student athletes would make good Rotarians. Vocational service calls every Rotarian to aspire to high ethical standards in their occupation and contribute their vocational talents to the problems and needs of society. 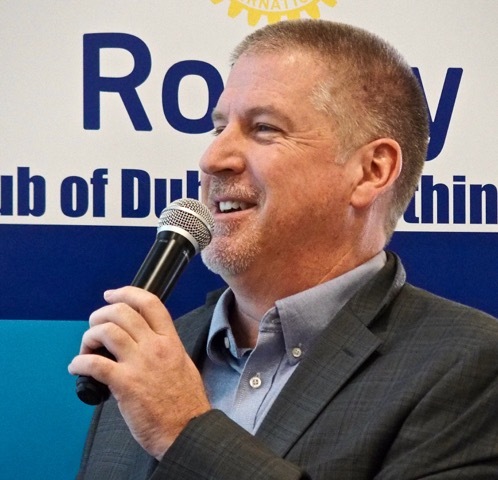 Two club members are spreading the word about Rotary and our club through their connections with local groups and individuals with their own communication channels. Alan Zink asked Perry Township Trustee Chet Chaney to place a story about the club and our new website in an e-newsletter that Chet sends to township residents. The story was featured in the December issue. Rachael Dorothy, who lives in the Colonial Hills area, contacted the editor of the Colonial Hills Courier and a story about the club appeared in the newsletter’s January edition, which is delivered to approximately 880 households. Thanks to Alan and Rachael for their initiative to inform area residents about our club and our service to the community. Our Club has committed to a New Generation Study Exchange this summer in Romania! The trip consists of one Rotarian team leader and 4 people from our community, ages 25-45 & the same from Romania. The trip lasts for 3 weeks and team members stay with host families during 3 weeks (approx. 6-7 families each). There will be opportunities to meet community leaders & site visits in the daytime. Most expenses are paid Dates: Outbound = Mid-may til early June Inbound = Mid August til early September (dates are estimates). If you are interested in either being a team leader or helping locate team members for this tremendous experience in Romania please contact Wynn Wiksell wcwiksell@sbcglobal.net or 614 296-7612 for more details. Furthermore if you would be willing to participate in chaperoning or hosting an inbound exchange person you also contact Wynn for details.